The more we visit our pond, the more we enjoy it. These days, when it’s so easy to travel far and wide, it’s such a treat to spend time becoming intimately familiar with one special place. I continue to be so appreciative of Angelicscalliwags for inspiring us to to this. 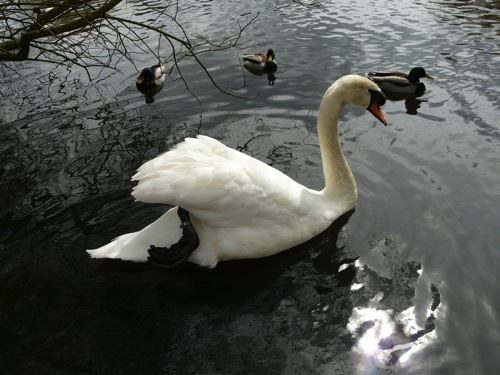 The swans were the stars of the show at our pond this April. Back at the start of the month we noticed that they had built a nest on the island. The following week we witnessed some very beautiful swan rituals. C(9) said it looked like they were synchronised swimming. There is a final photo in the series but I’ll spare your blushes and show you this preening close-up instead! 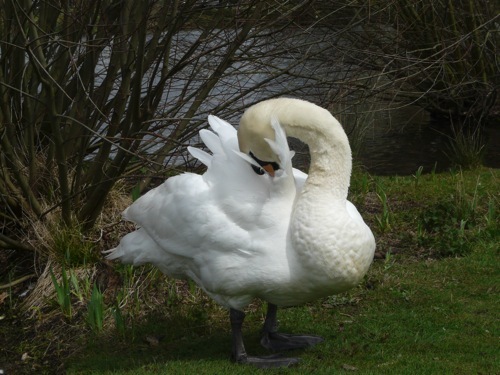 Later, one of the swans gave us an excellent view of its leg, on which it wore a metal ring. By zooming in on the photo, we could read that the ring was labelled “BTO British Museum Nat Hist London SW7”. We looked this up when we got home, and learned about The Ringing Scheme, which allows members of the public to report sightings of ringed birds. 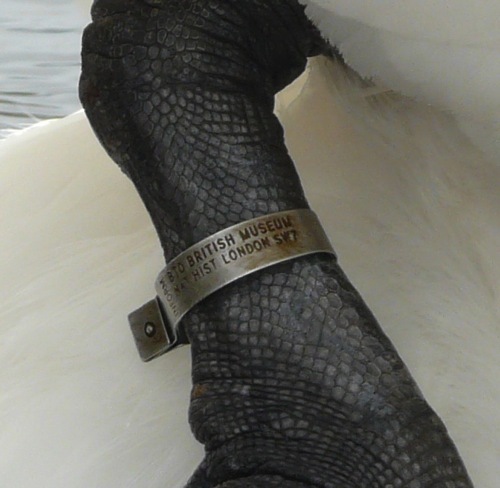 The rings on the Ringing Scheme website had numbers on, but we couldn’t find a number on our swan’s ring. C(9) has emailed the Ringing Scheme to find out more about this. 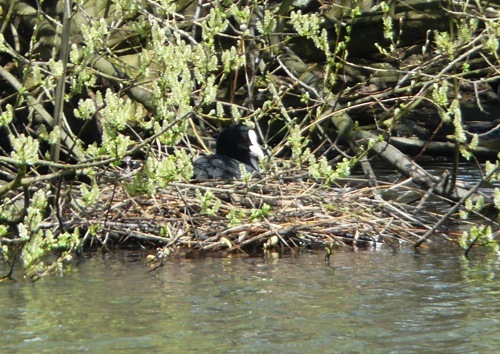 The coots are also nesting. They’ve picked an excellent spot, at the edge of the pond but very well concealed. I was only able to get this (very zoomed in) photo from the far side of the pond. 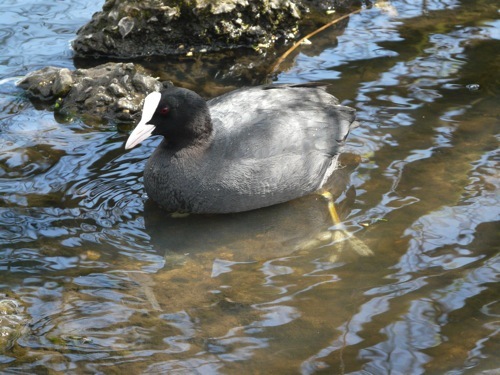 The male coot, meanwhile, has been much less shy. 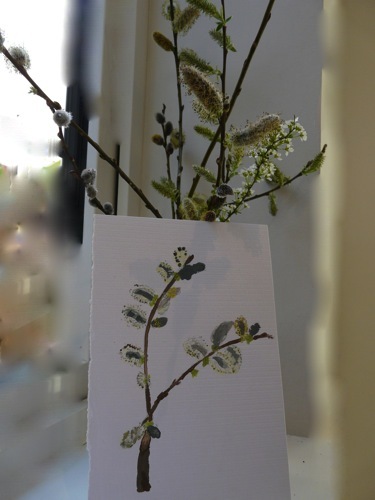 We admired how green the trees and plants around the pond have become, and brought a few small samples home to paint. The swans study was very cool and I love the watercolors. Gorgeous. We are trying to be more interest-led and I can definitely see my kids enjoying this! 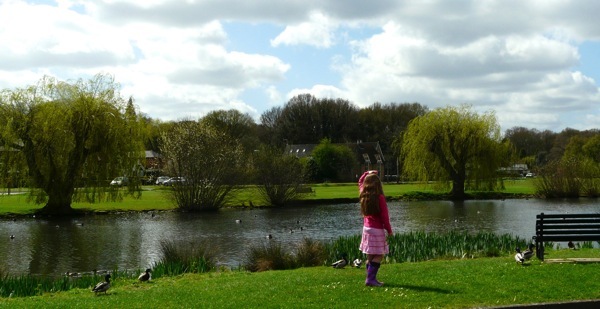 We’re watching the mallards and Canada geese at our nearby pond. And beavers! In the middle of the city! 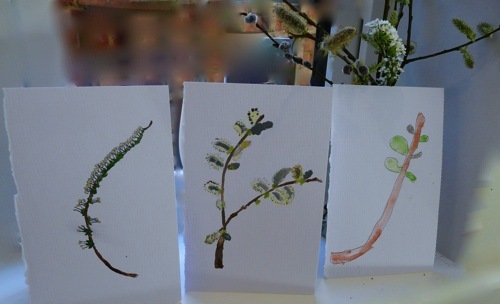 Lucinda I just love seeing your Nature studies. They are so beautiful and calming and full of goodness! I wish I could bring Keilee to each of your outings to join it. She would love it. Those swans are gorgeous aren’t they? Their art is really good! Your children are just beautiful and look so at home in Nature. Happy weekend! Thank you so much, Karen – you are so sweet! I hope you’re having a lovely weekend, too! 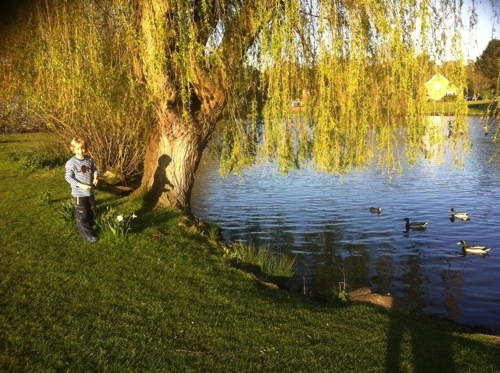 Your Pond Life study pictures are great and the swans are so beautiful, how lovely to have such a fantastic place to explore and investigate. Den building is a definite favourite past time with both our children and the guests we have on the farm, thanks for linking up to Country Kids. Thanks, Fiona. 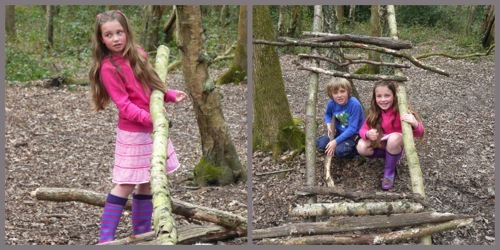 My children would love to have den-building at home as yours do! I think next time I will take a book so they can spend the hours den-building in the woods as they would like to. That’s so cool you were able to read the ring on the goose’s leg. We witnessed birdbanding just before we left Colorado and I would love to do it again. Ooh now there’s an idea – a field trip to where they band the birds! Thanks, Julie. Thank you, Nikki. We find painting really helps focus on the things we see. 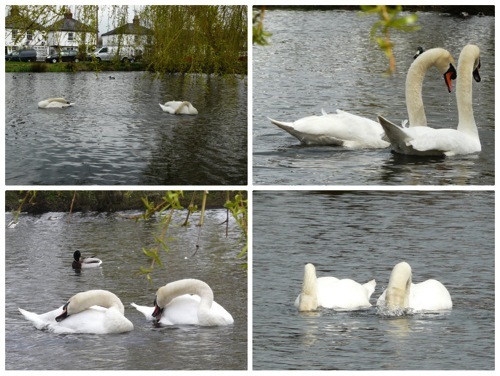 I just love, love, love the swan photos, like poetry in motion – gorgeous! Our little pond couldn’t support swans in the long term, although we very occasionally get them visiting! They were amazing to watch (and then a bit shocking at the end of the display!). I was looking at your frog and terrapin photos again earlier, they are so cool. I so want to find more animal life at ours! We just did our last pond study and whilst we were there the pair of Canada geese got out of the water. One had banding, the other didn’t, which surprised me. Although what I know about banding could be written on a postage stamp! me too! We just got a reply from the banding society, they said the number would be on the other side of the band. Don’t think we’ll be getting that close to the swan! This all looks so exciting to do as a child. I used to love looking at pond life as a child. Also love the painting – so good! Thank you, Ruth, I’ll pass on your kind compliment! 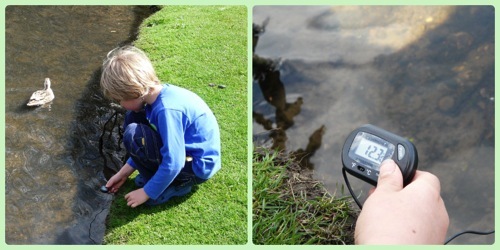 I love how you use what you find at the pond to bring learning alive for your children. The watercolor painting come out lovely. Hi Rebekah – thank you so much for stopping by and for your nice comment! The courting looks very interesting. I did not know that about the rings. 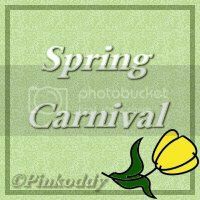 Thank you for linking up to the Spring Carnival. Thank you for hosting the Spring Carnival, it’s a great idea. I’ve just dipped into your blog a bit further. 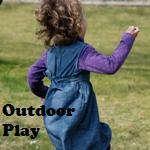 My son has Sensory Processing Disorder (and possibly high-functioning autism) so I shall be exploring much further! The watercolor paintings are beautiful. I’ll be pinning this! I love the pond, it’s gorgeous. Thank you so much, Hwee. I bet Tiger is learning how to build fantastic dens at Forest School! A lovely wholesome post, there’s nothing like using the resources close by – saves money, time and the planet really doesn’t it! 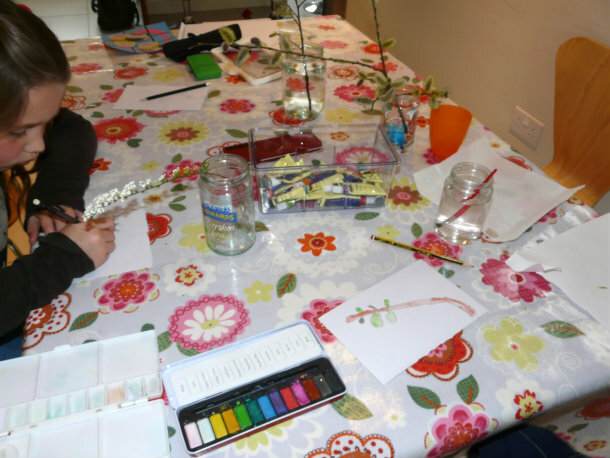 Also love the willow braiding… Have you tried making corn dollies? Last summer we picked a bunch of wheat from a field (asked mr. Farmer first of course – his reply was ‘as long as you don’t use a combine harvester to pick it…be my guest!’) and then we soaked in for a couple of hours in an old plastic window box to make it supple and had loads of fun with that… You can thread the stalks into themselves and make really big ones! You can also do it with those dark green pond/marsh grass too… Maybe there’s some of that near your pond? Thanks, Claire! I like the idea of using soaked wheat – we’ll look out for a friendly farmer! We made corn dollies at the Weald & Downland Museum, which was fun. Last year C(9) and a bunch of friends spend weeks making a massive willow plait. They took turns fetching it home to soak in water between meet ups. At the end of the summer they used it to climb a tree – they were very pleased with themselves 🙂 We’ll have a look for plaitable pond grass next time too. I’m formulating my own pond study too because of you and the study over at Angellic Scalliwags. It’s really got me thinking how to best go about it. Fantastic! It would be so interesting to see how different ponds are in the different places people live. I’ll look forward to hearing about yours.